Review: "Twilight Force: Heroes of Mighty Magic" - Sea of Tranquility - The Web Destination for Progressive Music! When three of the songs on your dragon-themed album have the word "might" in the title you better come prepared to knock out some wizards and war beasts---or else! 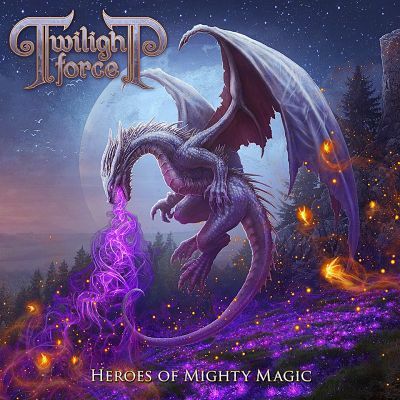 Thankfully and wonderfully, Twilight Force wields a mighty sword to slay melodic monsters and punish progressive power chords with every moment of this impressive recording. Heroes of Mighty Magic opens with "Battle of Arcane Might" a Helloween-inspired rousing number that showcases the guitar speed and vocal range of a band you can immediately hear is dedicated to crafting their own unique vision. "Guardian of the Seas" starts with a quasi-Russian naval anthem complete with a classical chorus backing up their claims of charms and dragons. I've never heard anything like it before and it stands as a true highlight of the album. "Flight of the Sapphire Dragon" has a jovial almost medieval-sounding track complete with flying creatures and magical adventure that could literally serve as a dramatic soundtrack for a sandals and sorcery video game. "Riders of the Dawn" is both the shortest and the snappiest song in the collection. And it brings attention to the listener the rare atmosphere of lyrical purity necessary to construct a musical blueprint for creating magical worlds. "Keepers of Fate," "Rise of a Hero" and "To the Stars" are fine minimalist examples of the new melding of symphonic metal with progressive chordal compositions. Twilight Force is wise to place these tracks toward the end of the album as a method to gradually introduce the style to their audience. The title track "Heroes of Mighty Magic" is an operatic gem combining playhouse theatre sonics with progressive metal to form a final salute in an album that appears in all aspects to be a concept project. It's truly hard to believe Heroes of Mighty Magic is their sophomore effort. For this band is on the road to real metal greatness.